We offer men's pants, hosen, and kilts in a variety of styles from full length pants or knee length breeches and are made of quality material. They are still long enough to tuck into your knee high boots and look great with doublets and vests. We offer pants, hosen and kilts made from leather, velvet, cotton, and twill and many of them have a drawstring waist. Our medieval pants, hosen and kilts come in a variety of styles, colors, and sizes to choose from. We offer breeches, pirate pants, medieval trousers, locksley pants, tights, and swordsman's pants. Men's pants and trousers are authentic to the period and are appropriate for SCA re-enactments, LARP events, weddings, Renaissance festivals, theater, and more! 15th Century Pants are drop-front pants crafted in a wool blend with leather tie closures. These are period accurate medieval hosen. These 15th Century Pants are drop-front pants crafted in a wool blend with leather tie closures. They are period accurate medieval hosen. These 15th Century Pants have a drop-front, are crafted in a wool blend, and have a leather tie closure. They are period accurate medieval hosen. These 15th Century Pants, Brown, Large, are crafted from a poly/wool blend in a drop front style. With their historically accurate look, they are perfect for reenactors. These 15th Century Pants, Brown, XL, are crafted from a poly/wool blend in a drop front style. With their historically accurate look, they are perfect for reenactors. These 15th Century Pants, Brown, XXL, are crafted from a poly/wool blend in a drop front style. With their historically accurate look, they are perfect for reenactors. A perfect complement to our Black Velvet Doublet, these black-on-black brocade paned pants have open slashes and a button-up front. They are great for a very noble look. It is available in black, as well as in sizes small/medium or large/x-large. Our 14th century Braies are short linen blend trousers designed to be worn under hosen, chauses or by themselves. Braies are meant to be very loose and comfortable. Our 13th century Braies are short cotton trousers designed to be worn under hosen, chauses or by themselves. Braies are meant to be very loose and comfortable. Our 15th century Braies are short linen blend trousers designed to be worn under hosen, chauses or by themselves. Braies are meant to be very loose and comfortable. These 15th Century Pants, Natural, Large, are crafted from a poly/wool blend in a drop front style. With their historically accurate look, they are perfect for reenactors. These 15th Century Pants, Natural, XL, are crafted from a poly/wool blend in a drop front style. With their historically accurate look, they are perfect for reenactors. These 15th Century Pants, Natural, XXL, are crafted from a poly/wool blend in a drop front style. With their historically accurate look, they are perfect for reenactors. The Aiel are a race of people who live in a desert, which they call the Three-fold Land. They have earned a reputation as skilled warriors. These Aiel pants are grey with a button-up front. Choose S/M or L/XL. These are period black knee britches with a royal satin like finish. They feature a button-up front and lace-up back with laced calves. They are made in rayon and come in sizes S/M or L/XL. They are inspired by the Showtime Original Series - The Tudors. Our Late 14th century Braies are short linen blend trousers designed to be worn under hosen, chauses or by themselves. Braies are meant to be very loose and comfortable. Chausses, hosen or leggings were tight form fitting legwear worn throughout the Middle Ages. Linen was the most common fabric for the chausses althought they were also made from wool. Chausses, hosen, or leggings were tight form fitting leg wear worn throughout the middle Ages and often footed. Linen was the most common fabric for chausses although cotton was available from India during the period. Our Breeches are perfect if you are a bit conservative for tights. Made of 100% cotton, these breeches would have been worn by the peasant or working class man. Long enough to wear with knee-high boots or wear at the top of your calf with sandals. Our Captain Cottuy Pants are made from super soft and comfortable rayon with an elastic and drawstring waist. Loose fitting to the knee. Below the knee, the leg is fitted with eyelets and lacing for the best fit with boots. Our Draw String Pants are a typical, Medieval style with a straight leg. Made from woven cotton, these pants have broad bottoms and a draw string waist for easy wearing. Available in several colors. These Captains Pants, made of cotton velveteen, are perfect to wear while lounging around the ship all day. Our Child's Breeches are perfect if you are a bit coservative for tights. Made of 100% cotton, these breeches would have been worn by the peasant or working class man. Great for boys and girls. Our Child's Harem Pants are made from thick & rich cotton. Elastic Cuffs and Drawstring at waist for easy wearing. Great for boys and girls. Our Child's Sailor's Pants are made from 100% cotton, our Sailor's Pants have a elastic waist band and discrete deep front pockets. Try the Stripes for a true pirate look! Great for boys and girls. These c1583 Child's Venetian Breeches are reproductions from a pair in the Germanisches Nationalmuseum, Nuremberg. Ours are made of cotton velveteen and lined in cotton so they're machine washable, tumble dry. Our Plus Size Captain Cottuy Pants are made from super soft and comfortable rayon with an elastic and drawstring waist. Loose fitting to the knee. Below the knee, the leg is fitted with eyelets and lacing for the best fit with boots. The Don Juan Riding Pants offer a look with period flair and impressive design. Made from black cotton twill, these slim-fit pants have an elastic fitting in the rear to ensure a perfect fit while on horseback. These riding breeches feature a stitched riding seat and rich black twill trim down the outer leg seam. Cotton Canvas Pirate Breeches are modeled after one of the most famous pirate styles. 100% cotton canvas, cuffs start just below the knee, secured with drawstrings. Integrated Elastic waist. Wear with pirate boots- or go barefoot like a deckhand. 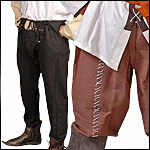 Drawstring Cotton Pants designed to fit the needs of LARP, Medieval or Renaissance reenactors! Drawstring waist two sizes Reg: 28-50 inch, XXL 60 inch. Wear them loose, wrap the legs, or stuff them in your boots. 100% cotton. Our Gladiator Shorts are authentic gladiator wear. Historical Period Pants, perfect for most Medieval or Renaissance outfits. Cool and Comfortable with Draw string waist. One Size fits 28 - 50 inches. Wear loose or wrap the legs with cord for Viking periods. Suits most period outfits. The Fencing Pants are made of 100% machine washable cotton. These snappy, knee length pants can be worn with.any of our doublets. They can be worn with leggings or thigh-high boots. There's plenty of room for movement. Our Hose 15th Century Linen match the clothing styles from the 15th century. Hosen or leggings were tighter, and no longer two separate legs with an integral codpiece (a simple flap) for convenience. Our Harem Pants are made from rayon fabric. Elastic and drawstring at the waist for easy wearing. These pants are broad at the hip and have button cuffs at the ankle. Our European Medieval pants are made from high quality viscose fabric. Buttoned ankle cuffs and an elasticated waist provide easy and comfortable wearing. Our Gothic Death Pants are dark as death itself. These pants are no loose fitting baggies- rich and thick viscose fabric grabs the leg, the eyelets and laces help you tighten the squeeze. These Lace-Up pants feature a low rise with lacing on the outside of the legs. Elastic and drawstring at the waist for easy wearing. Our Harem Pants are made from thick & rich cotton. Elastic Cuffs and Drawstring at waist for easy wearing. Great for men and women. These 100% cotton Medieval Hose, Brown, Medium are taper-cut with a drawstring waist and a button fly front closure. They will match a variety of medieval outfits. Fits a 34" waist. These 100% cotton Medieval Hose, Brown, Large are taper-cut with a drawstring waist and a button fly front closure. They will match a variety of medieval outfits. Fits a 36" waist. These 100% cotton Medieval Hose, Black, Medium are taper-cut with a drawstring waist and a button fly front closure. They will match a variety of medieval outfits. Fits a 34" waist. These 100% cotton Medieval Hose, Black, Large are taper-cut with a drawstring waist and a button fly front closure. They will match a variety of medieval outfits. Fits a 36" waist. These 100% cotton Medieval Hose, Black, XL are taper-cut with a drawstring waist and a button fly front closure. They will match a variety of medieval outfits. Fits a 38" waist. These 100% cotton Medieval Hose, Black, XXL are taper-cut with a drawstring waist and a button fly front closure. They will match a variety of medieval outfits. Fits a 40" waist. These 100% cotton Medieval Ankle Laced Pants, Brown, Medium are full-cut with a sharp taper at the ankle. Featuring a drawstring waist, button fly and cord ankle-ties, these pants are a match for many period costumes. Fits a 34" waist. These 100% cotton Medieval Ankle Laced Pants, Brown, Large are full-cut with a sharp taper at the ankle. Featuring a drawstring waist, button fly and cord ankle-ties, these pants are a match for many period costumes. Fits a 36" waist. These 100% cotton Medieval Ankle Laced Pants, Brown, XL are full-cut with a sharp taper at the ankle. Featuring a drawstring waist, button fly and cord ankle-ties, these pants are a match for many period costumes. Fits a 38" waist. These 100% cotton Medieval Ankle Laced Pants, Brown, XXL are full-cut with a sharp taper at the ankle. Featuring a drawstring waist, button fly and cord ankle-ties, these pants are a match for many period costumes. Fits a 40" waist. These 100% cotton Medieval Ankle Laced Pants, Black, Medium are full-cut with a sharp taper at the ankle. Featuring a drawstring waist, button fly and cord ankle-ties, these pants are a match for many period costumes. Fits a 34" waist. These 100% cotton Medieval Ankle Laced Pants, Black, Large are full-cut with a sharp taper at the ankle. Featuring a drawstring waist, button fly and cord ankle-ties, these pants are a match for many period costumes. Fits a 36" waist. These 100% cotton Medieval Ankle Laced Pants, Black, XL are full-cut with a sharp taper at the ankle. Featuring a drawstring waist, button fly and cord ankle-ties, these pants are a match for many period costumes. Fits a 38" waist. These 100% cotton Medieval Ankle Laced Pants, Black, XXL are full-cut with a sharp taper at the ankle. Featuring a drawstring waist, button fly and cord ankle-ties, these pants are a match for many period costumes. Fits a 40" waist. Our Harem Pants Plus Size are made from rayon fabric. Elastic and drawstring at the waist for easy wearing. These pants are broad at the hip and have button cuffs at the ankle. These soft cotton Madagascar Pants will be a must for any pirate outing! Available in Black, Brown or Tan & Navy Stripes, the wide elastic waistband and ankles allow for a comfortable all-day fit. These soft brown, poly-cotton stretch pants will make just about any steampunk ensemble as sporty as can be. Real pockets at the waist with a brown wooden button at the cuff. Order S, M, L or XL. These sleek, turn-of-the-century black pants are a great addition to your steampunk wardrobe. The front has a traditional thirteen metal button flap, giving them a true sophisticated look. Four matching buttons adorn the bottom split-seam cuffs, while black suspenders hold your pants firmly in place. Our Kensington Pants are comfortable and structured pants are made from poly-cotton and twill, making them great for wearing all day. Silver-gray and black pinstripes cover the pants, which are designed with no waistband to ensure an authentic look. Medieval Braies will allow you to keep cool and comfortable in the summer heat. Be part of the middle ages in these period accurate medieval shorts, you can wear them with our hose, under other clothing or as shorts. Made from heavy cotton, with an elastic waistline, these pants are perfect for your Robin Hood, Rogue, or Outlaw costume. Stitching details down the front of the leg add to the rustic look. These comfortable Medieval Velvet Stretch Pants are a great alternative to wearing tights. Loose fitting with an elastic waist- great for feasts. Made from cotton velvet, they work for time periods from Medieval to Renaissance. Available in Black, Soft Green and Grey. Renaissance Knee Breeches are perfect for most Renaissance or Medieval outfits. The legs lace on your calves just below the knee. One size. Sold at By The Sword, Inc.
Pirate Pants make a perfect addition to your Pirate Garb, also suitable for a variety of period outfits. Draw string waist with pockets. Sold at By The Sword, Inc.
Our Medieval Pants are designed to fit most historic periods. These pants come with lace up ankle cuffs, an elastic and a drawstring waist for a very comfortable fit. Made from Linen or twill, these are very durable and washable pants. Medieval Two-Tone Pants fit most historic periods. These medieval pants come with lace up ankle cuffs, elastic and a drawstring waist for a comfortable fit. Wide variety of colors. 100% Cotton Twill Made in the USA. By The Sword, Inc.
Watch a group of women drop what they are doing as a man in hosen walks by. Women love a man in a pair of Medieval Hosen! Our hosen made of 92% cotton, 8% Spandex. The cotton breathes, the Spandex clings to your shape. Not everyone wants to be royalty. So be the Scoundrel you always were meant to be in our light-weight cotton Sailor's Pants. These period tights will complete just about any period outfit. Made from soft, stretch cotton with an elastic waist. Available in Brown, Black, or Grey. These flowing pants have an elasticized waist and a great fall. The width of pants increases from bottom towards the waist. Made of rayon. These Medieval pants are made with high quality rayon. Drawstring at waist and ankles. Our Medieval LARP Pants are simple, inexpensive, versatile, lightweight and comfortable medieval pants. Worn by men or women and perfect for LARP or SCA events, Renaissance Faires or even belly dancing. Made in USA from cotton. These 100% cotton Medieval Hose, Brown, XL are taper-cut with a drawstring waist and a button fly front closure. They will match a variety of medieval outfits. Fits a 38" waist. These 100% cotton Medieval Hose, Brown, XXL are taper-cut with a drawstring waist and a button fly front closure. They will match a variety of medieval outfits. Fits a 40" waist. These full-cut Pirate Pants, Natural, Medium are made from 100% cotton with a drawstring waist and button front closure. Fits a 34" waist. These full-cut Pirate Pants, Natural, Large are made from 100% cotton with a drawstring waist and button front closure. Fits a 36" waist. These full-cut Pirate Pants, Natural, XL are made from 100% cotton with a drawstring waist and button front closure. Fits a 38" waist. These full-cut Pirate Pants, Natural, XXL are made from 100% cotton with a drawstring waist and button front closure. Fits a 40" waist. These full-cut Pirate Pants, Brown, Medium are made from 100% cotton with a drawstring waist and button front closure. Fits a 34" waist. These full-cut Pirate Pants, Brown, Large are made from 100% cotton with a drawstring waist and button front closure. Fits a 36" waist. These full-cut Pirate Pants, Brown, XL are made from 100% cotton with a drawstring waist and button front closure. Fits a 38" waist. These full-cut Pirate Pants, Brown, XXL are made from 100% cotton with a drawstring waist and button front closure. Fits a 40" waist. These full-cut Pirate Pants, Black, Medium are made from 100% cotton with a drawstring waist and button front closure. Fits a 34" waist. These full-cut Pirate Pants, Black, Large are made from 100% cotton with a drawstring waist and button front closure. Fits a 36" waist. These full-cut Pirate Pants, Black, XL are made from 100% cotton with a drawstring waist and button front closure. Fits a 38" waist. These full-cut Pirate Pants, Black, XXL are made from 100% cotton with a drawstring waist and button front closure. Fits a 40" waist. These Wayfarer Pants are a great pair of versatile pants for almost any time period. These are super comfortable and made of soft rayon. The waistline has a pair of faux buttons in the front with an elastic waist and lace-up back. Renaissance Cotton Pants with loose fitting legs. Adjustable waist, laced cuffs, cod flap, hidden pockets. Made from soft 100% textured cotton. Also fit the needs of medieval, pirate and buccaneer personas. Worn by men or women. Medieval Single Leg Hose is a traditional men’s garment worn over one leg and tied at the waist. Made from wool blend, secured with cotton drawstrings, the Medieval Single Hose is designed to keep you warm, comfortable, and stylish. These tan medieval pants are designed to fit most everyone and are made from heavy, thick and roughly textured cotton. Designed specifically for larp, these pants are very wide and baggy so you can move! These black medieval pants are designed to fit most everyone and are made from heavy, thick and roughly textured cotton. Designed specifically for larp, these pants are very wide and baggy so you can move!